Modern building methods have made newer homes far more energy efficient than ever before. The downside is that lack of sufficient ventilation means that condensation is more likely to occur. In this respect, older properties have a distinct advantage – draughty windows, doors that don’t fit perfectly and fireplaces provide plenty of natural ventilation (but let’s not go there regarding hefty energy bills to compensate!). So why does condensation occur? 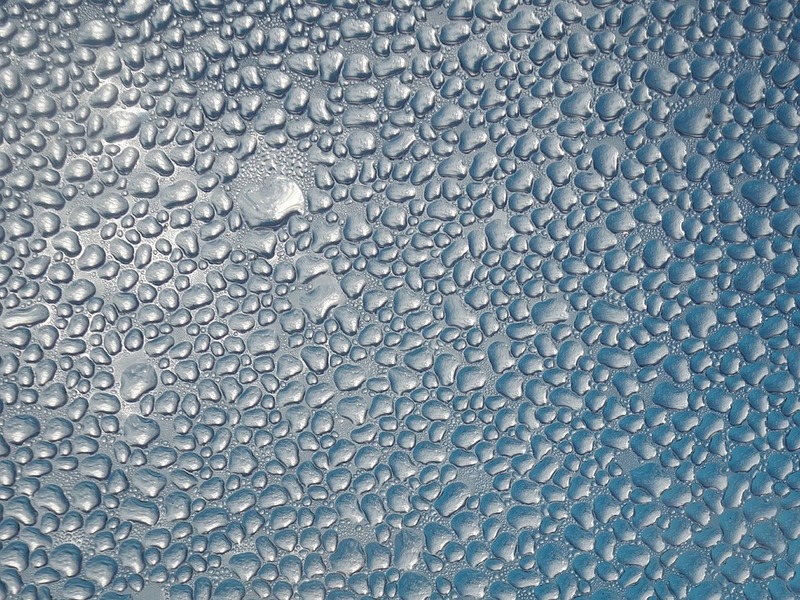 Condensation is caused by moisture in the air. If the air is cold, it cannot hold all the moisture and this appears as droplets of water on cold surfaces – think windows, mirrors and tiles after you’ve had a bath or shower. Those are the obvious and visible signs of condensation, but it can also form in places where there is little movement of air such as behind large items of furniture and in corners. Over time, excessive condensation can have an effect on your property – the dampness can lead to mould growing on walls and furniture, wooden window frames will start to rot, you’ll find mildew on fabrics. Needless to say, this level of damp compromises human health as well. Dry windows, windowsills and any other affected surfaces every morning. Bedroom windows can be affected because during sleep our breathing adds more moisture to the air than during waking hours. If you have the option to hang washing outside to dry, do it! If not, hang wet items in the bathroom, with the door shut and a window slightly open. If there is an extractor fan, this will help. When you run a bath it’s better to run cold water first and then add the hot. This will significantly reduce a steamy atmosphere and so limit condensation. In the kitchen, cook with pan lids on. Once the water has boiled, turn down the heat to a simmer. Don’t use more water than you need, use enough to cover the vegetables. Consider using a dehumidifier to help control the air’s moisture content. Whenever possible, open windows to allow the air to circulate. You don’t have to suffer a howling gale blowing through your home, opening a top window – however slightly – will help. This is especially true when you’ve been cooking or washing up by hand or after a bath or shower. Open a window and keep the doors closed to prevent moisture escaping into other rooms. Leaving a bedroom window slightly open at night is also a good idea (and not just for condensation – did you know that a lower temperature in your bedroom can mean a much better night’s sleep?!). Don’t push large furniture such as sofas and wardrobes tight against walls. A small gap will reduce the risk of restricted air circulation. Check how well your home is insulated and draught-proofed. Keeping the whole property warmer will reduce the occurrence of condensation, plus your fuel bills will be reduced. None of us want to waste energy unnecessarily, so turning off radiators in an unused room seems a sensible decision. However, creating cold spots encourages condensation. A balanced heat throughout your home is far better than keeping your living room really toasty. How do I know it’s condensation and not damp? Condensation doesn’t leave an unsightly tidemark on your walls, damp does. It’s a tell-tale sign that there is a bigger problem that needs to be dealt with – either rising damp, a plumbing issue or a problem with the roof. If that’s the case, a specific defect survey will help you identify the problem and how it should be rectified. If you think you may have a problem with damp, give us a call on 0800 980 3113 or email to organise your specific defect survey.